April 5, 2019 /0 Comments/in Singing /by Elaina R.
Singing in a “breathy voice” has a mixed reputation among singers and educators, and for good reason: it can be risky. 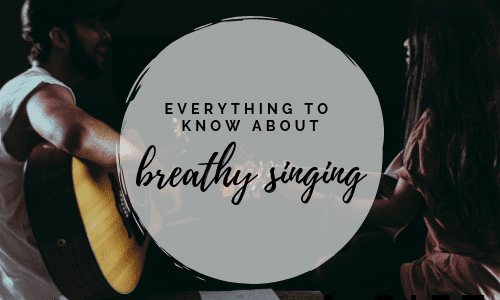 In this article, we’ll discuss the mechanics of singing with a breathy voice, if it’s harmful, and how use to the technique safely. Remember the spectacularly cheesy film “A Walk to Remember”? In this 2002 film, Mandy Moore sings a pop ballad called “Only Hope” using excessive breathiness to create a fragile, emotionally charged aura for her character. This is a perfect example of using breathiness as an emotional tool. Breathy singing, characterized by a quieter, fuzzier sound than normal singing, is still often employed by vocalists to evoke everything from sensuality to sadness. To understand breathy singing, it’s helpful to examine how the human voice works. Singing is produced by air moving past the vocal cords (also known as “vocal folds”). As air moves past the vocal cords, the cords come together and vibrate, producing sound. The process of the vocal cords coming together so they can vibrate against one another is called “adduction.” When a singer is using just the right amount of air to produce the sound, the vocal cords adduct and vibrate seamlessly. As a result, the sound is clear, efficient, and easy to produce. If the singer uses an excess of air to sing, adduction isn’t as efficient. The sound, colored by the extra air rushing past the vocal cords, becomes breathy. Is Singing with a Breathy Voice Dangerous? Breathy singing tends to be frowned upon by voice teachers because it can be a sign of improper vocal technique, or even underlying health issues. Many singers are incapable of producing a clear tone at all and have no choice but to sing with a breathy voice. This can be caused by an inability to properly regulate air flow, excess tension in the neck or lower face, and actual vocal cord damage. The strain of the extra air rushing past the vocal cords also tires out the singer faster, causing swelling and other health issues. If you’re unable to sing with a clear tone at all, we highly recommend that you visit an ear, nose and throat doctor (ENT) for a stroboscopy – a procedure in which a doctor uses a tiny camera to look at your vocal cords and check for damage. Untreated breathiness can be caused by chronic swelling, pre-nodular lumps, and other serious issues that could lead to vocal hemorrhaging or vocal nodules. If these issues become too severe, they can require therapy and even surgery to fix. If your cords are healthy and you’re able to produce a clear tone, but want to experiment with using a breathy voice as a stylistic tool, don’t worry. It is possible to create a breathy sound without damaging your voice. Take Ariana Grande for example in “Thank You, Next.” She uses a breathy tone at the beginning of the song to sound nonchalant yet beguiling. If you would like to safely dabble in breathy voice technique, keep the following tips in mind. Since breathy singing requires less efficient adduction and therefore puts extra stress on the vocal cords, use it sparingly. If you’re singing a long set, it may be best to choose a few songs to use this technique on. If your voice is already tired or strained from allergies, lack of sleep, or overuse, it’s best to avoid breathy singing entirely and sing as efficiently as possible to protect your vocal cords. Breathy voice is best limited to the most comfortable parts of your range (think speaking range), where you’re least likely to strain your voice. It’s best not to attempt to sing notes in the extremes of your range with a breathy voice, as you’re more likely to be straining in these areas, even without the added stress of compromised adduction. Since the beginnings of contemporary songs tend to be in a moderate range, you may want to experiment by starting a song with a breathy tone and then coming in stronger on the chorus. This is a fairly common approach in pop, R&B, and other popular music. Breathy singing just doesn’t carry as well as clear singing, and attempting to do it loudly is a recipe for disaster. Only use a breathy voice when you’re singing quietly. Since breathy singing is best executed at a low volume and is a contemporary technique, you can’t really do it without a microphone. If you’re performing live in a noisy venue, make sure your microphone is turned up and that your mouth is close enough to the microphone so your breathy singing can be heard. If you want to experiment with using a breathy voice, consider taking voice lessons or classes. A qualified voice teacher will help protect your voice as you experiment with this technique. With proper training, you can become a more flexible singer without compromising your vocal health, even when you sing with a little extra air! Post Author: Elaina R. Elaina is a singer and voice teacher from Fort Wayne, IN, where she teaches at the Purdue School of Music and in her private studio. She received her Master of Music from the University of Michigan. Learn more about Elaina here!